After the 20/30 Fast Track program (lose weight — 20 pounds in 30 days), Onslow Weight Loss & Wellness offers an optional extended program that will turn your good nutrition and light exercise regimen into a lifestyle that ensures long-term health benefits. 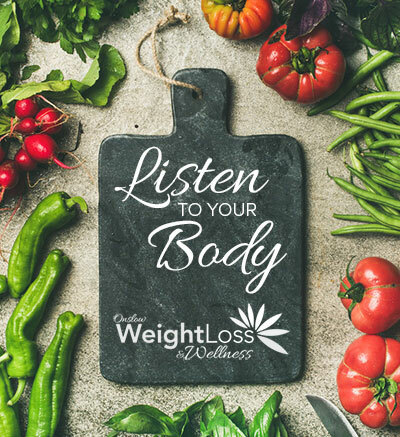 Listen to Your Body keeps you on the track to lose weight (or maintain your goal weight), while helping you balance the hormones that have been making it difficult for you to feel good. Your body is flowing with hormones that control your energy, mood, sleep patterns, and the food you crave. In fact, hormones control nearly every bodily function. The Listen to Your Body program will give you expert insight into how your body reacts to these hormones that block your weight loss efforts at every turn, no matter how hard you exercise. Hormones like insulin, progesterone, pregnenolone, estrogen, testosterone, cortisol, adeneline, thyroid, and DHEA — have a dramatic impact on how you feel from day to day. The program will help you to achieve your wellness goals, maintain or continue weight loss, and balance hormones. You’ll receive regular encouragement and be challenged to resist backsliding as you adapt your lifestyle to a new dietary and health regimen. Special recipes and dietary plans designed to address your personal physiology will be developed in a partnership between you and your wellness coach. *Following the program exactly as described. Individual results may vary. Call us today at (910) 750-8098 and take your first step into a healthier life!